Your kids are running around, yelling. There’s a puddle of something sticky on the counter. You cue up Moana on the iPad to keep your toddler entertained while you (finally!) 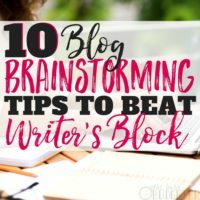 sit down to write your blog (and yes, in your two-day old pajamas, messy bun and hooded sweatshirt). I know, I know. You wonder how you'll possibly come across as an authority on anything (momming, adulting, budgeting) when you’re not doing it all perfectly. But you know what? That struggle is what makes your life relatable. It's what will help you grow your blog audience. Your audience is probably some version of you—even if you’ve figured out tips and tricks to overcome a few of your less-than-ideal habits or if you want to share your talents and insights. Your reader looks to you as someone he or she relates to, because you’ve been there. Here's the deal: I want you to use your feelings and experiences to your advantage. Draw on your real life and let your day-to-day inspire you! Promote what you’ve tried—just like you’d do with a close friend or family member. You aren’t selling an image of perfection or a lofty ideal, you’re talking to readers about REAL life. You’re sharing REAL life problems you've solved or are solving yourself, like what to eat, what to wear, how to do your makeup, how to decorate your living room, or (my fave!) how to run your budget. You’ve been there. You know this. Getting real will only help you grow your blog audience and help more people JUST like you. You're approaching problems and questions as a friend. If you’re genuine, they’ll see it…so for it. (Yes, even if you’re in your bathrobe and your kiddos had ice cream for lunch.) It’s time to get real. When you aim for too perfect, it's paralyzing. Why? Because perfection is a facade. None of us is perfect, and frankly, maintaining a façade is totally, TOTALLY exhausting. So, let perfection go! You're building your blog, so let your personality shine through! Readers love to feel like they’re reading information from a REAL, LIVE person. That’s part of the whole blog appeal. They're looking through a little window into this real person’s life. They’re sharing experience with you. They’re telling you how to solve your problem because they’ve had that problem too. Even if you get nervous about grammar, tech stuff, or even simply writing a coherent post, just blargh it out there. Don’t worry about sounding perfect or using the right phrasing. Don’t worry about the technical aspects of blogging. Get your thoughts out first. Brainstorm a bunch of posts ahead and then you won’t struggle for a topic. Once you’ve written out a draft, you can always go back through, refine, edit, run it through grammar and spellcheck, and work on the layout. Sometimes, though, you must START to get the ball rolling. Once you begin to type and get your thoughts out, you can pretty it up later. Another fear that paralyzes bloggers? This idea everyone else knows what they’re doing, but you don’t. Well, let me tell you—give that one up right now! I’m about the LEAST techy person I know. I’ve learned a thing or two of course, but when I first started out I had NO clue. Zero. If your knowledge will speak to your reader, solve their problems and connect with them—whether it’s a recipe, budgeting information or decorating tips, share it! That’s your message! Focus on doing THAT well, because ultimately that is what's going to grow your blog audience. As for the other aspects of blogging, don’t feel like you must do it all. You’re a fantastic decorator (or baker, or budgeter, or whatever). You don’t also need to be an amazing photographer, graphic designer and computer programmer! Just do you. You got this. Start building your blog from what you know. Write about what you’re good at. Knowledgeable, real, useful content will drive traffic to your blog. If you’re really knowledgeable about the topic, it'll come through in your writing. Write about topics you’re passionate about and good at. Write about what you know will help your reader and change their lives—topics you’re excited to share. Once you start to build your blog, you can always invest money back into the technical aspects. 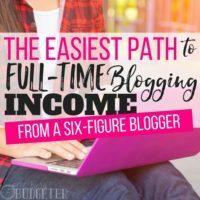 One of the tips I love for new bloggers is to build some income and invest it back into your blog. Find someone who can do beautiful graphic design, great photography, or help you with the tech side of your blog. For now, work on enthusiastically sharing what you know. Opt for simple designs, tech and photography, and upgrade down the road! Your readers want to know who you are! Use a photo on your blog, put a name and a face to your brand so they get to know you! Blogging is powerful because it puts real people with real problems in front of each other. When you read a magazine, you can write a letter to the editor…but what are the chances the letter will get read, published and responded to? When you read a blog, you engage with the author RIGHT on their post. This realness and accessibility is one of the best parts of blogging, so maximize it! Share photos on your blog. Even if you can’t afford a professional photographer, it’s okay. Again, when you can upgrade your technology, you can upgrade to more professional-looking photos, but when you’re starting out, do the best you can. It’s more important your audience sees you and feels like they connect with you. Remember: you are the face of your brand. Interact with your audience members on social media. Share pins and re-pin other blog posts on Pinterest. Pinning and interacting with others on social media will greatly increase your exposure. For more on Pinterest strategy, please check out my guide here. 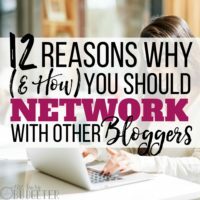 Get yourself out there—connect with other bloggers and affinity groups. There are tons of blogging circles and groups you can join on Facebook and through other social media. Take a foundational blogging course like Elite Blog Academy, where there’s a tightly knit community built into the course (as a bonus that course is AMAZING- it took me from $18/month to full-time income from the blog in just 10 months). Be open to conferences and other options to meet bloggers and even audience members face to face. One of the best ways to really get to know your reader is to create an what's called a “reader avatar.” Your reader avatar represents your real-life reader. Get to know them. Imagine what your typical reader would look like. What's their personality like? Are they married? Do they have kids? Do they work? What are his or her problems? What questions does he or she run across in their day-to-day lives? How can you help your reader? Get to know your reader and write directly to them. It might feel a little silly at first to imagine details of your ideal reader, but once you’ve got the details of your avatar down, I promise the exercise will really help you refine your message and grow your blog audience with really well-targeted content. The real deal? Your blog readers are REAL people. They're real readers searching your blog and hoping for a solution to their dilemma. Putting yourself in their shoes helps you pinpoint whether or not you’ve answered their needs with your posts. If you’ve succeeded, chances are high they’ll keep coming back, so you'll be well on your way to successfully building a loyal blog audience. You can visit sites like Peek by UserTesting for a free user test. Here's how it works: a random person will film themselves viewing your blog and give you feedback on their initial impressions of your site. It’s a great way to see your site through your audience’s eyes and to ensure your site is user friendly and conveying the right message. If you aren’t sure about UserTesting, ask an honest friend to read through your posts and take a look at your site and blog. What are their initial impressions? What do they think of your posts? Do they find the information helpful? Find a friend who is most aligned with your reader and target audience. As you listen to everyday discussions and situations, take notes. Use a voice memo app on your phone and simply record your thoughts or jot down your ideas in your planner, notebook or notes app on your phone. Get in the habit of writing down ideas right away because you won’t remember later. Many of your ideas will be brainstormed and gleaned from real-life situations. Your blog is full of what you’re passionate about. You’re sharing information and those insights with friends. Listen to their input and feedback and incorporate it into your posts as you go. Being an honest blogger means never selling out. If you use clickbait-y “get rich quick” schemes, spam your readers or build in thousands of popup ads, you'll put off your readers and drive traffic away from your blog. Even if you’re earning money from your blog, embrace honesty and never promote products or services you don’t care about or haven’t tried yourself. There’s a lot of buzz about affiliate marketing and advertising out there. It’s true, becoming an affiliate is a great way to earn money from your blog, but it’s only useful if you’re honest and write about what you know and love. Readers are smart. They'll see right through a product or promotion you aren’t passionate about. They'll know when they’re being marketed to. If you want help with affiliate marketing, please check out my guide here. There’s no magic wand you can wave to grow your blog audience. The best formula—what worked for me—is always being honest in what you write and keeping it real. Only write about topics you care about. Always write to your avatar and think of the topics, products, services and ideas to bring value to their lives. Your goal as a blogger isn’t to contribute to the noise, junk and spam on the internet! There’s enough out there. There are no “get rich quick” schemes that work, and most of the deals promising thousands of followers using a trick, are bunk. In fact, some of them are even illegal or at the very least can get you blocked or frozen on social media (not a good look). All this talk of sharing and honesty is really important, but first and foremost you always want to protect your family. When you’re blogging you’re definitely putting a piece of your life out there for all the world to see. It’s up to you how much you want to let readers in and what you feel comfortable sharing. Photos of your kids, your private information and even your religious, political or worldviews don’t necessarily need to be shared on your blog. If you’re comfortable sharing family photos it’s fine of course, but you shouldn’t feel pressure to put your kids on the internet if you aren’t comfortable with it. Remember to keep your blog on topic. It’s okay to add realness to your blog and personality of course (it’s encouraged!) but suddenly going on rants or expressing polarizing viewpoints may cost you readers. If you want to really grow your blog audience and establish your brand, stay on-topic and focus on what your blog is all about! Unfortunately, there are jerks on the internet. There are also well-intentioned “helpers” out there too who get critical, bossy or offer unsolicited opinions and advice. And then there are those who will tell you every word you’ve written about is wrong. Your parenting style is wrong. Your diet is wrong…blah blah blah. Learn the difference between constructive feedback and crazy. There are trolls and not-so-nice comments you’ll need to learn to let roll off your back. When you put yourself out there, there are people who might say hurtful garbage. Don’t let it get you down! Blogging is an amazing way to share information with others. It’s a great method for earning money from home where you can be your own boss and set your own schedule. In short, blogging is awesome! So when you blog, do it with integrity. Keep it real so you connect with and grow your blog audience. 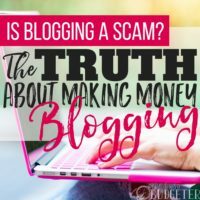 If you’re honest with yourself and your readers, I promise you will find blogging is super rewarding, fun and easy! So, how do you keep it real on your blog? 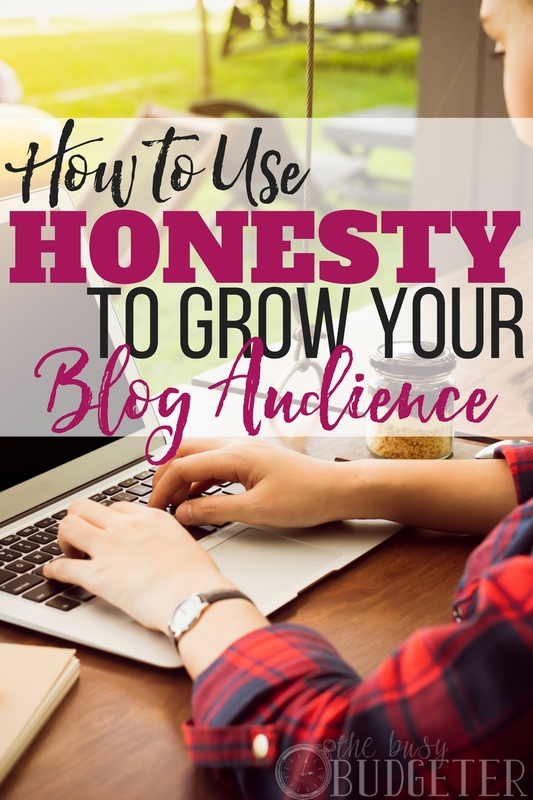 What are your tips for staying honest with and growing your blog audience? I love this post! I was so nervous to get honest about my debt with my audience but I got a message from a follower who was inspired by my honesty. She was so happy that I shared and it felt really good to get that feedback. My mess is my message. Honesty is scary but so worth it! I needed to hear this today. I need to stop trying to do everything at once and learn to prioritize and focus on that. Thanks! Your advice is so spot on, Rosemarie. Perfection is overrated. I’m learning to talk to my reader like I would to my friend. It makes all the difference and suddenly the struggle for finding our voice is also over. We don’t do that when we talk to friends. We alos don’t have to convince people about our honesty either, honesty shines through words like in your posts, and ‘our’ people recognize and connect with it immediately. Hena | Mending with Gold recently posted…Which Of These Two Is The Best Affiliate Marketing Course? This is great advice, Rosemarie. Thanks so much! I appreciate the reminders as well. Like #5 Listening to feedback … it’s so important and actually helped get clarity on re-designing my blog when I first started earlier this year. Peek Testing is awesome as long as you can get over the criticism. Plus, listening to your readers can help you come with ideas for posts and products. There are people making money from products that came from readers’ feedback — that’s free R&D! Thanks for the advice, Rosemarie! I just started blogging about 6 months ago and have had most of the thoughts you mentioned above. I share a lot about my marriage and family life. Loved this post Rosemarie! Angie and I started our FullTimeFullLife.com blog on Labor Day. We were just talking last night, again, about how we always want to remain honest and real. You were part of the inspiration for us finally starting our blog! Thanks again for all your encouragement. I absolutely love this! I’m learning to let go and not stress. Doing what I know well or am passionate about. I don’t have to be the best photographer especially as a beginner. Thank you for this! I’m definitely going back for a re-read. Thank you. I needed this. I blog about autoimmunity and I want to help others live well, so I worry about sharing about my bad days and my struggles. I can see how it would be helpful though. Thank you for the reminder to keep it real. So much truth here! Some of my most shared and loved posts are the ones where I share how badly I messed up! Great advice, Rosemarie. Being real is so important. The whole perfection thing is what I found off-putting about someone with the initials MS. 🙂 I remember watching her years ago and she’d be presenting something as if no one else in the world had ever thought of it, and it would be something I remembered my mother doing when I was a kid. Very annoying. I think the biggest mistake is trying to sell too early, instead we should focus on building a relationship with our audience then if any business, we can sell later but this should not be the priority.